RUMSON – Twice a month on Sundays musicians have a chance to play the music they love but may not often get the opportunity while pub patrons get a chance to revel – and maybe dance a little – to the music of their Irish heritage. Molly Maguire’s Black Point Inn, 132 East River Road, has been getting musicians together for the first and third Sundays for the last eight months or so for a very Irish tradition, the musical session. 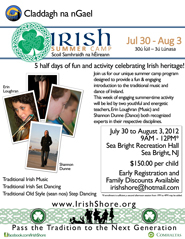 That’s where those playing a variety of instruments – fiddle, mandolin, flute, guitar, among others – come and sit in to play the instrumentals, steeped in the centuries-old Emerald Isle heritage. Musicians come together at Rumson’s Molly McGuire’s for the bi-monthly session of traditional Irish music. Mike Maguire, who has owned the pub and restaurant for about a year-and-a-half, said he’s been enjoying the sessions. “It’s fun, it’s nostalgia,” he said, noting his own heritage is two generations removed from his Irish roots. The sessions feature anywhere from six to 20 musicians who play between 6 to 9 p.m., performing a variety of eclectic numbers, some dating back for hundreds of years, according Maguire and Bob Pfeffer, who organizes the events. “It’s a real folk music. It’s soothing. It’s relaxing,” Maguire said. For Pfeffer, who is not Irish, the attraction is that it’s dance music. He acknowledged the joy he gets when people start taking to the floor as he and others start ripping it up with such standards as “Garryowen,” a well-known and popular tune. During a recent Sunday, some were making their way to an open floor area, including young children who were stepping lively. The practice of sessions, which has lived on for ages, had somewhat fallen out of favor in the U.S. and elsewhere by the 1940s and ‘50s, but has seen a resurgence during the last couple of decades, according to Pfeffer. “Now there are thousands and thousands of people playing,” and not just in Ireland and America, but even in places like Greece, he said. Pfeffer, who lives in Ocean Township, said his email blast has brought musicians from all over this part of the state traveling to Molly Maguire’s to partake. Some musicians have been known to play for hours during sessions conducted around the world. “I was in Ireland when they started a session at 9 o’clock [p.m.] and continued to the next morning,” he said. “I think it’s great because it keeps him in touch with his Irish roots,” said Gail Woods, Odhran’s mother, revealing her lilting Irish brogue, carried from her home in Drumshanbo, in County Leitrim. “It’s a chance to practice and connect with others interested in this music,” Woods said. And, Odhran insists, he enjoys it.